Holi a grand bacchanal festival full of fun, frolic and revelry celebrated every year with gusto in the month of Phalguna (March/April). The lively elements of ancient festivals such as Madanamahotsava, Kamamahotsava and Vasantotsava have survived in the festival of Holi. On the eve of this two days festival, grand bonfires are lit to burn all impurities and on the second day people play with colored powder and water. People indulge in drinking as a ritual of drinking the nectar of Gods, singing of love songs and the temporary adjuration of certain restraints of everyday life, dancing, and merry making; Ritual obscenities are uttered to drive away evil spirits. There is an easy naturalistic explanation of the Holi festival. After the apparent suspense of winter, the coming spring called people away from their houses out into the open as a symbolic gesture whilst a statue of Visnu or Krishna is brought out from the temple on the occasion of a Dolyatra and put on a swing, this may be seen as a pastime, a holiday away from the darkness, regularity and fixity of temple-life, but also as a celebration of the Rasalila. The divine couples were put on a swing and swung gently to and fro called Vasantotsava. Other than the rainy season, Spring-swinging would help in building up the mood of fertility. Rhythmic movement in dance was thought to be magically effective to allow the season to move forward and to speak. The swing signifies masculinity and the seat femininity, and they are united. This union is made at the beginning of the hymn for the sake of the offspring. The spring, the mango tree, the flowers, the smell, the cuckoos, the bees, the moon all creates a symbolic carrier of vitality, the God and the love. 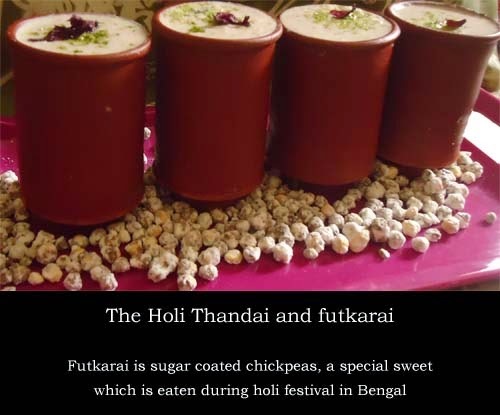 This Thandai drink is very special for Holi. I adopted this non-intoxicated version from Nita Mehta. 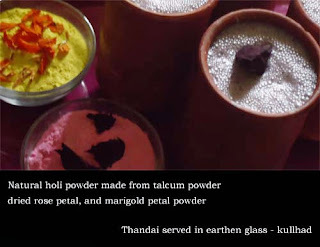 The Thandai drink is best served in earthen glass [kullhad], we called it "matir khuri". Buy clay glass carefully. See to it that it does not have any hole in it. Wash the dust and immerse in cold water before use. After getting soaked some water it will keep your drink more cool. Mix and grind all the ingredients to a powder. Churn milk and prepared powder in a mixer until frothy. Add crushed ice and give 2 to 3 churn more. Pour in glass, sprinkled prepared powder, garnish with dried rose petal and serve. Yield: for 2 person | Prep Time: 10 mins. | Cook time: 5 mins. | Total time: 15 mins. Ritual fact is: Hindus worship and celebrate the Divine with unparalleled variety and fervor. Dance, song, prayer, meditation, processions, pilgrimage, bathing, painting, symbols and rituals are all valid ways of connecting with Divinity. To the Hindu, spiritual life is meant to be lived joyously, as Holi demonstrates. Holi is a social as well as festival of whole nation. It does not discriminate people on the basis of either caste or varna, all classes of people celebrate it with great zeal. People embrace each other forgetting the differences. O dear, it is painted with spring in the woods – The branches, the leaves, the flowers and the fruits, All the corners and hideouts it is painted with. The horizon is smeared with colours, The earth turns passive with the melodic spree…..
During the months of March-April the trees are almost leafless yet embellished with bright flowers. It is that time of year when there is natural fragrance and color spread in the environment due to blooming of many flora. It is also blooming time for Silk-cotton and its crimson-red flowers are also used to prepare eco-friendly color to play with. The call of the cuckoo and the red robed palash or erabadu blossoms are cues that is around the corner during spring time in Bengal. The cry of the Koha dominates the chatter of squirrels. This is not another cuckoo species but the female Asian, generally known for its bad nestling habits. The male cuckoo’s call actually signifies its need to find a mate. The cuckoo also uses its call as a ploy to distract the crow. A time of spreading the message of unity and joy, the Vasanta utsava is a much looked forward to event in the country as Holi. 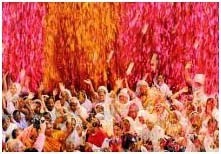 Holi also includes the ceremony known as fire festival or 'Chachery" in Orissa. Some people also call it 'Nerapora ন্যাড়া পোড়া'. some others call it 'Burir ghor porano'. 'Nerapora' is included as a part of the festival in the Utkal region of India. This ceremony takes place in the evening just before the day holi is celebrated. People burns dry straws, date or coconut leaves or human structure made of straws with great enthusiasm. This ceremony is known by different names in different states like in Odisha it is known as "Holipoda", in south India it is named as 'Kama dahanam'. This ceremony is also celebrated by our neighboring country Nepal on holi festival. They celebrate it in front of the King's palace. They decorate the wooden post "Chir pole" adorned with flags. In Bihar people enjoys by joining as groups from burning Holika of the demoness Putna and Putni to Holi and Nepal's holi it show many colors. Although, it is known by several names in different parts of the country but it is mainly the celebration of reconnection with the neighborhood like the olden days. Everyone is equal in holi. holi is witnessed in the palace of Akbar, and also in the palace of Nawab Asaf-ud-Dualla, Suja-Ud-dualla. During the reign of Humayun, Babur's son. 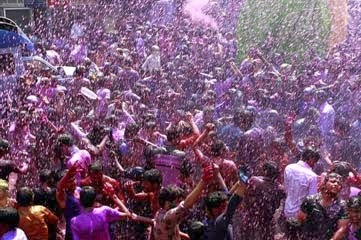 Holi was celebrated for continuous 19 days. In Shahjahan's court, people there used to get excited with the colors of Phagwah. There are different types of names in different places for recognizing this colors. In northern states it is holi, whereas in the southern states it is 'Kamavilas and Kaman Pandigai', in Karnataka it is 'Holi Hunnive' also known as "Kamana Habba", in Punjab it is known as 'Hola Mohalla, and 'Shimga' as well as 'Hutashani mahotsav' in northern India. Elephant Festival is a festival celebrated in Jaipur on the day of Holi festival. Kolkata was used to become "colored Kolkata" since the time of ruling of East India Company, was given five days "Holiday", the red colored water of holi gave the remarkable name of 'Laldighi' and mountain like Abeer at Lalbazar for Holi is now a history. Some consider it to be the tree of Devils. On the contrary, it also has a reputation of being a spiritually sacred tree, known as Dev Vriksa due to its thorny appearance and is depicted as the tree of Yama the lord of death. The Bhil tribe has a superstition which is associated with silk cotton and the wood of this tree also is not used as a fuel source by them, but all these beliefs acutally has led indirectly to its survival and preservatin in nature for a long time. It is one of the preferred species for Honey bees for building their hives. Many bee hives can be seen on a single huge Semal tree. The tree is mentioned in the oldest scripture the Rigveda and Guru Granth Sahib as a God tree. 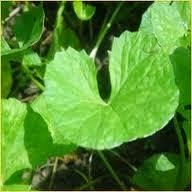 It is considered to be a part of Panchavati where five spiritual trees were planted together. Jayadeva in the Gita Govindam compares the blossoms of palash or Kinshuk to the red nails of Kamadeva or Cupid, with which he wounds the hearts of lovers. Reddish juice may ooze from the cutting of bark. The juice when exposed to air hardens into glassy ruby-red gum known as Bengal Kino. The kino is highly medicinal being good astringent. 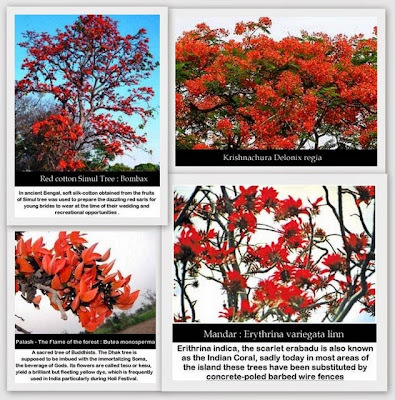 The leaf plates of palash tree are used by the Bhils in Khargone District. The Holi festival or ten-day vernal festival is the saturnalia of India and terminates with feasting, drunkenness, obscenity and a bonfire on the last day of the Hindu month Phalgun, is often associated with the flowering kadamba, tamala, and parijata trees. Earliest textual references regarding celebration of Holi have been found the 7th century Sanskrit drama "Ratnavali"
Those trees with blossoms of another color are seen in a red mist, since their newly opened leaves glow red. The bakula is said to crave for a mouthful of wine sprinkled at its roots before it is willing to open its buds. The Champaka needs to be in the vicinity of loud and joyous laughter from the mouth of a lovely girl. Mango, and Ashoka are mentioned especially. According to the Mahabharata drinking of the Kalamra or Mangiferus indica (Mango variety) (rejuvenates youth / makes one youthful) forever. It will be a real pleasure to serve this Thandai. Their "wide smile", "twinkle in the eyes", and "milky moustache" will satisfy you a lot. I searched for palash flower everywhere, but my city "Kolkata" returned me empty-handed. Makhana or lotus seeds slightly toasted with ghee and make powder of it. Soak all seeds and nuts for 30 minutes and make a paste with tender green coconut water. Churn yogurt and honey in juicer until frothy. Add fruits. Add prepared paste. Add spices, rose petals, tulsi leaves and sandalwood powder now. Churn 3 to 4 times more. Pour in glasses, sprinkled pistachio powder, garnish with dried rose petal and tulsi leaves and serve. Yield: for 1 person | Prep Time: 30 mins. | Cook time: 10 mins. | Total time: 40 mins. Any natural color can be obtained from vegetables and edible flower or leave mixing with talcum powder such as basanti color can be obtained by boiling sawdust of the wood of the jackfruit tree or its powder, is still used for dying the robes of Buddhist monks. According to a scientific study, a tree with a life span of about 50 years generates Rs 3,75,000 worth of oxygen per year. It recycles Rs 4,50,000 worth of water and provides Rs 3,75,000 worth of soil erosion control and soil fertility. It also provides Rs 7,50,000 worth of air pollution control and provides Rs 3,75,000 worth of shelter and home for animals and birds. Going by these figures, it is difficult to estimate the losses suffered by the environment in India on every Holi. Approximately thousands of Holi fires are lit across the Country. And considering that tons of wood go up in flames in each bonfire, the final figure touches a mindboggling 30,00,000 kg of wood and, in the process, taking a toll over 7,500 trees. An alleged environmental issue related to the celebration of Holi is the traditional Holika bonfire, which is believed to contribute to deforestation. Activists estimate Holika causes 30,000 bonfires each burning approximately 100 kilograms of wood every year. Methods to further reduce wood consumption during Holika have been proposed, including the replacement of wood with waste material or lighting of a single fire per community, rather than multiple smaller fires. defying the tradition that bids them to stay away from festivities of all kind. They sang, they danced, they laughed and they shed tears. They threw flowers at each other and played with gulal. There are several cultural rituals associated with Holi. It has a religious purpose, symbolically signified by the legend of Holika. The night before Holi, bonfires are lit, known as Holika Dahan (burning of Holika) or Little Holi. People gather near fires, dance and sing. All the subjects should be free for fun and frolic, laughter and mirth. Children should play, jump and romp around, armed with lathis or stick, should go out like brave warriors and collect wood and dung-cakes for Holika (holikotsava). Holika Dahan also Kamudu pyre is celebrated by burning Holika, the devil. Holi celebrates the death of Holika in order to save Prahlad, and thus Holi gets its name. In olden days, people use to contribute a piece of wood or two for Holika bonfire. The holika-dahan where a pole of debarked stem or branch of sacred tree Simul is used as a Holi-Danda and burnt in northern parts of the India. A coconut is tied on the bough, liquor trickled and vermilion is applied, and cut in such manner so that it looks like it has a head and two arms. The place of holika dahan should be clean. After cleaning the courtyard grass, wood, pual, dung-cakes should be collected there. All people should go there in the evening and sit facing east or north. They should perform havan in a proper manner, when the purnima tithi starts, a child should bring fire from the home of a vrittika and Holika should be set a fire, recitals of mantras, roaring laughter and day abandon kill the evil-spirited she-demon Holika the younger sister of Harinakashyap. The fire protected the child, but that she-demon was burnt to ashes. Those who do not want to attend the common Holi, the ordinary process of worship of the pile going through, burn a Holi at home and worship, and then it is immediately followed by Bom Thokna means the striking of the back side of the hand against the mouth and producing a loud sound. They have to fast that day. 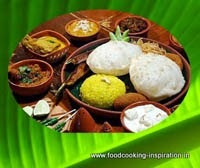 Food is in the nature of Brahma, Rasa is in the nature of Vishnu, and ther eater of food is in the nature of Mahesh. Visitors to homes are first teased with colours, then served with Holi delicacies, desserts and drinks. After playing with colours, and cleaning up, people bathe, put on clean clothes, visit friends and family, which ritually aims to generate harmony in the society. The festival of holi is celebrated jointly by the Bhilala with other groups of people living in the villages on the full moon day of Falgun Poornima. The bhil people do not attent Bonfire. On the day of Holi the Balai or drummer makes around of the village or Bhilkhera in the evening after the worship of coconut (batki) lemon etc to the bonfire are relieshed with joy. At Padalya (well water), half portion of the coconut is returned back to the profferer. It is found that a Semal stick is fastened in the Holi ground about a month ago, which they brought from other villages. It is properly guarded by the village chowkidar so that it is not stolen and it gets burnt in the fire and half burnt semal stick is taken out in the morning and dipped into the well water or Padalya. The villagers never fasten a stick cut from their own village. In the morning sacrifice of a chicken is also made. Thereafter the village women come there singing songs offers jowar grains and pour water on the Holika. Santals have "Baha Parab or spring festival" . Byoms have a splendid dance to usher in spring. Oranos have Phagoa Utsab. Chakmas called Biju. In Kumaun, Assam the Holika bonfire is known as Cheer which is made into a ceremony known as Cheer Bandhan, fifteen days before Dulhendi known as Chharadi, in Kumaoni (from Chharad, or natural colours made from flower extracts, ash and water). The Cheer is basically a bonfire with a green Paiya tree branch in the middle. The uniqueness of the Kumaoni Holi lies in it being a musical affair, whichever may be its form, be it the Baithki Holi (literally Sitting Holi is a form of musical gathering starting from the day of Basant Panchmi), the Khari Holi and the Mahila Holi all of which starts from Basant Panchmi. the Baithki Holi is also known as Nirvan Ki Holi or Holi of Salvation. Dola Purnima is a popular festival in the coastal districts of Odisha. Lord Jagannath is worshiped by the name of Dolagovinda in this festival. From this day onwards the odhiya calendar begins and it is worshiped on Dolabedi in front of Dolagovinda. It is the full-moon day in the month of Falguna. An annual fair, which is called 'Phool Dol Ka Mela' is held here on Phalgun Shukla ( March-April) for five days. About one lakh people attend the fair. It is also famous for Phad paintings. There are quaint Holi customs such as Lathamar Holi of Barasana, where women beats men with long sticks. Huranga at Dauji temple in Baldev gaon (village) at Mathura where men receives beating from the hands of women wielding cloth whips and fire ordeal. At Phalen, a tiny village in the Braj region near Prahlad, Kunda a Panda or Priest of the temple of Pralhada walks through a big fire at midnight. At Vrindavan, Holi is celebrated with Rasleela, which is based on Krishna lore. The fifth day of holi is called the Rang-Panchmi. In Nepal during the Rang-Panchmi day, all the streets were colored green and red and that even the frontier was dyed in a similar manner. There even the ears of both men and women are syringed with colored water. Revelers dance as they are splashed with colored water during a procession for the Rangapanchami festival in Madhay Pradesh. The festival is celebrated on the fifth day after the Holi festival. In Braj region around Mathura, in north India, the festivities may last for more than a week. The rituals go beyond playing with colours, and include a day where men go around with shields and women have the right to playfully beat them on their shields with sticks. In south India, some people worship and make offerings to Kaamadeva, the love god of Indian mythology, on Holi. Gangaur Festival is celebrated throughout the state of Rajasthan. Starting from the first day of the Hindu month Chaitra (the day following Holi), the festival goes on for 18 days. For a newly married girl, fasting for full 18 days of the first Gangaur festival after her marriage is absolutely compulsory. During the Gangaur Festival, females apply mehendi (henna) on their hands and feet. On the seventh day after Holi, the unmarried girls spend the evening carrying ghudlias (earthen pots with a number of holes all around) on their heads with a lamp burning inside them and singing songs. Roaming around in the streets, they collect small presents of cash, sweets, jaggery, ghee, oil etc.